Me, My Data and I | Who is in control of your personal data? The White House blog post “Big Risks, Big Opportunities” summarized a White House report highlighting some of the consequences that big data and machine learning will have on our everyday lives. The hope is to create awareness in how to better harness this new power and mitigate the legitimate potential issues with respect to civil liberties, privacy and opportunity. But does the White House have a point? If the power of big data is left unchecked, there’s a risk of perpetuating discrimination and bias within the very scripting of these algorithmic systems. An example would be how advertisements are tailored to us on all of our social media platforms and email alerts. Basically using all available information and passive data collection to “segment” or “label” you and put you in a box to sell you something in a box. Every time you search the web for a product, like something on Facebook, re-tweet a post, you can be sure that there’s some machine learning algorithm combing and filtering through your choices and creating a cyber fingerprint of all of us. The fear is that there will be obvious gaps where potential discrimination could occur, therefore your cyber self is a poor stereotype of who you truly are and represent. As a foodie, with an Italian background, that could mean I’m handcuffed to only receive Rosa’s Italian restaurant meatball bonanza specials, and never see my Indo-Chinese favorite “all you can eat” buffet promotions! From these early algorithms, to the creation of advanced big data machine learning, Artificial Intelligence seems to be evolving and becoming ever more ubiquitous with our current technology integration. Hollywood’s ominous portrayals of how the final birth of AI will forever impact humanity doesn’t evoke too much confidence. Let’s face it, the Terminator and SkyNet are closer to reality than ever before. Why do they always end up wanting to kill us to save us? AI’s early ancestry consists of inputs, coding and ultimate framework that are being constructed by the most flawed, biased and destructive creatures to inhabit the blue dot – us. Are we able to ensure we instill the best of us for the pursuit of a better tomorrow, Siri? I have just read a fantastic article in the New York Times. I haven’t seen the differing philosophies around privacy articulated better. Max Schrems has done a wonderful by making this intangible, inanimate issue animated! So another PIMS app downloaded and I hope this doesn’t end in the same old “meh” feeling I usually get. There needs to be something more exciting or enticing about this stuff, despite its importance and function in our everyday lives. I have tried quite a few of these tools/platforms/apps now. I sign up to them for research into the realm of digital privacy, so I can share my findings with others and selfishly to exploit the best method of managing my own data. Snooze… That’s my point. How do I successfully drive interest and make people care about understanding what happens to all the data we type into our PCs, Laptops and Smartphones. Owning this information is incredibly important but no one seems to care…yet. Despite the recent plethora of “hacking” incidents, the most notable being the Sony Pictures hack, people don’t seem to realize that this is just the tip of the proverbial iceberg. 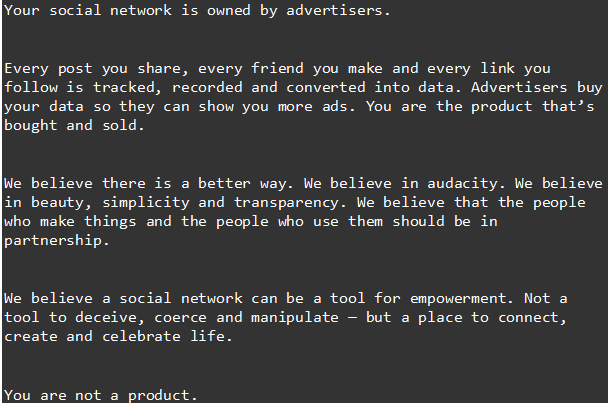 I have signed up to Mydex, Ghostery, Handshake, PrivacyGrade, The Respect Network and Ello and each time I get really excited because at the core they are all great tools and ideas that promise some spec of what I am searching for. Unfortunately so many of these services are amazing in theory but in practice just aren’t particularly practical and perpetuate the ‘so what’ question. The biggest shortcoming of all is their lack of customer insight which is an interesting paradox considering the nature of this blog! I wonder how much these companies are talking to their customers and welcoming feedback. None have followed up with me, and that is odd considering most are in their beta phase and could benefit from a two way conversation with the initial all important “adopters”. People very quickly become disinterested when there is no ‘real’ additional value. I am getting frustrated at the lack of two way conversation or relationship that I think should come as part of the package. Come on PIMS, I am willing you on! Which leads me nicely into the new app I just downloaded – CitizenMe, which seems to be on the right track and has a rather nice gimmicky game like element. This is an incredibly easy app to set up and link with your other apps and social networks. Navigation was also incredibly intuitive and the language was easy to understand – no legalese! What I found most interesting was my personality profile based on my Facebook content and friends ‘likes’ or comments. It was scarily accurate, describing my preferences for social occasions better than I could myself. It got my age very wrong but I am too flattered to care. The interface is really cool and the thing most people will be interested in is their personality scoring but after that I fear that the ‘so what’ question could come up again. How often will I really open this app? How often will I use it? What additional value will it give to keep attracting me back, let alone the average person who doesn’t really care about their privacy? What would make you use a PIMS? So long story short I stumbled across a great site for you to check out privacy ratings called PrivacyGrade. I actually found this through reading an article by Kim Komando highlighting the cost to our privacy when we acquire free apps. Of course some apps need our personal information such as google maps, but what about apps like the Despicable Me game or Fruit Ninja? Why on God’s earth do they need this information? Speaking of God… more on that later. We all know we don’t read the terms and conditions and unless you are on iOS you can’t set your own privacy settings on a case by case basis. This is where PrivacyGrade can help and it is run by a team of researchers from Carnegie Mellon University who have devised a simple grading system from A+ to D. This grading model measures the gap between our expectations of privacy behavior vs the actual behavior. For example when you download Google Maps you know they will need access to your location data, or Gmail will need access to your contacts to make sending emails easier, you know what to expect and therefor both these apps get an A. “It does what it says on the tin” so to speak. In terms of the low scorers the most surprising was the #1 Holy Bible app which scored a D, the lowest grade. This app’s permissions require full access to your network, your user accounts, your phone status and identity, can read your contacts and track your approximate location. Not only that but you also give permissions to third parties such as Flurry, Facebook, Tapjoy, Jsoup and Oauth! 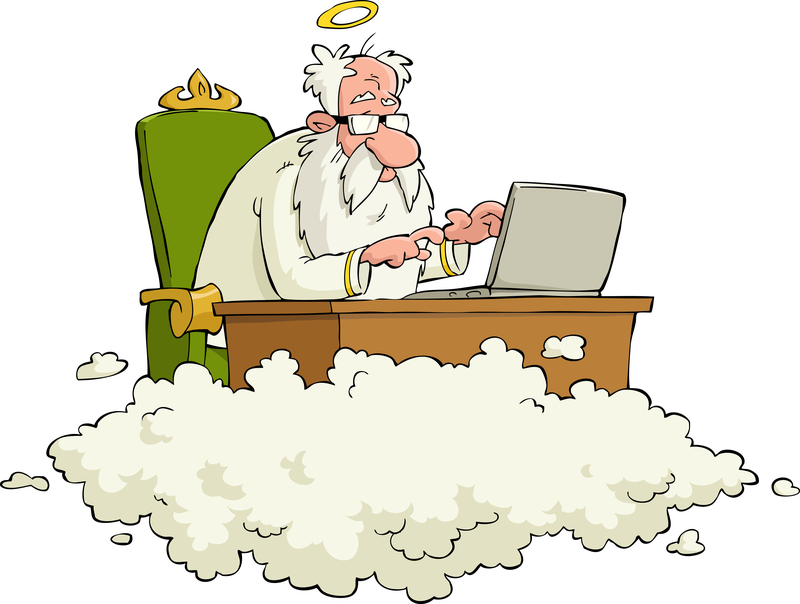 Who would have thought catching up on ‘His Word’ would require so much of your passive data. Also concerning is the related app Bible for Kids which requires the same permissions. This was graded C which I don’t understand as the details are pretty much the same and I would have thought that our expectations would be stronger around privacy considering the target audience. Targeted advertising to your kids anyone? So after quite a long wait I finally got my invite to Ello! 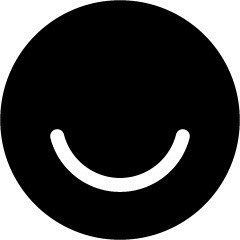 For those of you who haven’t heard of Ello it is the new social media platform which is committed to being ad free FOREVER. This is truly exciting for a nerd like me who has a big interest in who owns/controls our personal information. It has potential to offer a real alternative to other social platforms without the cost of giving up our valuable information and pushing advertising right into our news feeds. If any of you are interested in joining me on Ello, Let me know I am happy to send you an invite so that your wait doesn’t have to be as long as mine! It has been while since my last post so this story may feel a little old but a discussion last week made me reconsider the whys. The story concerns Risa Puno giving away free (edible) cookies in return for personal and sensitive information at a Brooklyn Arts Festival. 380 New Yorkers were willing to give away their finger prints, partial social security numbers and have their photos taken without any explanation to what would happen with their information. In fact if and when they did ask she would refer them to her terms of notice which was a page of small legalese giving her the right to share their information with third parties. Isn’t this completely irrational? OK the cookies looked pretty cool and probably tasted awesome but still it is completely illogical to give something so private away especially when it can be shared with anyone. Do people lose all common sense and thought when it comes to a freebie? The answer is obviously yes AND we all do it all the time and not just for a freebie but for convenience? I don’t necessarily believe in mass irrational behavior though, having read Irving Goffman’s ‘Asylums’ he outlines how we take on roles to cope within our environment. He describes these irrational rituals as institutionalization and quickly I began to see the rational within some of the odd habits you can see exhibited by patients within a medical institution. On this basis I ask myself how we are conditioned or institutionalized to offer up some of our most personal information so easily and exhibit this irrational ritual nearly every day. Last week at the TMRE conference I listened to Charles Duhigg talk about his book ‘The Power of Habit’. 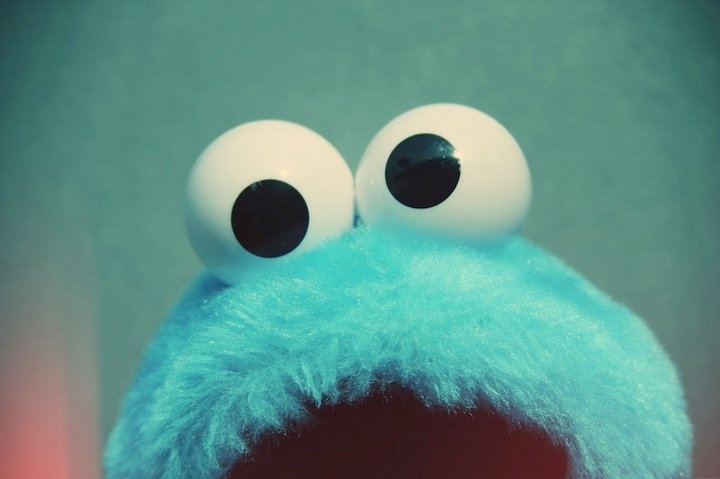 I have read his book before but listening to him again reminded me of the cookie story. To summarize, our habits are formed from cue’s and rewards. Take the lab rat experiment conducted by Ann Graybiel. This is where a rat is placed in a T-shaped maze with the rat behind a barrier and chocolate at the end, when the barrier goes up there is a click and the rat finds the chocolate and then eats the chocolate. The first time this happened it actually took him a long time to figure out where the chocolate was but as predicted each time he repeated the experiment he got faster and faster. What became interesting were the measurements recorded of the rats brain activity during the experiments, at the beginning the brain activity showed high peaks right from the click of the barrier through to him eating the chocolate, but with each experiment the brain activity dropped between the click and the eating of the chocolate. 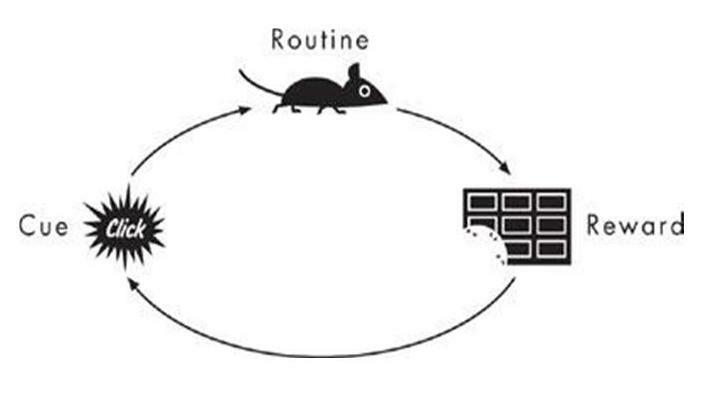 Over time the rat was literally able to follow the routine between the cue and reward without any brain activity – he had stopped thinking and acted on pure habit. We do this all the time and I am sure you can remember a situation like arriving at work or home thinking ‘how did I get here’?- we literally switch off and go into a trance when something is routine enough, be it the gym, shopping or scarily the drive home. Is this our institutionalization when it comes to giving our information away? we are doing it every day, each time we go online, each time we purchase and each time we use our store cards, it has become so routine now that even cues and rewards aren’t necessary. This is such a bad habit that our lives can’t really function without doing it, we have agreed to these rituals to function effectively in our world. Do you think it is rational or irrational to give your information away so freely?